Anchors are right at the heart of cruising. They allow remote and wonderful places to be visited, without the benefit of a solid dock or even mooring buoy. Put that notion with the recent comments from yachts surviving (or not surviving as the case may be) the recent spat of hurricanes worldwide, and it is clear one of the most important pieces of equipment onboard is your anchor, and associated gear. Here in New Zealand where the author resides, the majority of visiting cruisers still carry the older generation anchors such as plows (e.g. CQR), Deltas, claws (e.g Bruce), and flat-blade Danforth types. These boaters may not be fully aware of the benefits of the newer generation type anchors on the market � which have raised the bar somewhat in expectations of anchoring performance. Cruising can be something of a numbers game, and ensuring you have the best anchor possible is one way to stack the odds in your favor. 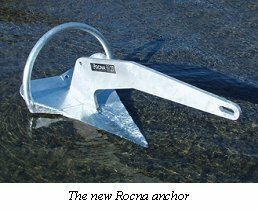 The author must confess at this stage to being the designer of the Rocna, a new anchor design which is receiving an excellent response from the international offshore fleet visiting New Zealand, with orders now also coming in from overseas. Rather than allow this article to deteriorate into an info-mercial for a particular brand, the differences between the older and newer designs will be discussed in general. Most testing (and yes, it is accepted that anchors are very difficult to test properly, but there do exist some informative comparisons) shows a big improvement evident in the new generation, which only reinforces what more and more cruisers are seeing for themselves. such as the moving parts of hinged-shank plows, which can cause injury to crew as well as reducing strength; blade shapes designed to furrow (i.e. plow) through the ground (CQRs and Deltas), and the "hopping and skipping" behavior of claws (Bruces) together with their tendency to skip along the bottom rather than reset. Inconsistent setting leads to unpredictably anchoring. Most anchors must be in a particular attitude (position and angle relative to the seabed) in order to set, and slight flaws in the design of the anchor lead to the attainment of this attitude being a hit-and-miss affair. The plow (particularly hinged-shank versions) is the worst offender. If a CQR, for example, lands with its blade in an upright position, it will usually set without problems, but if the blade (the actual plow part) lands on its side, with the shank rotated away, that anchor will be lucky to set at all. Commenting on the results of Danforth's 1988 testing, Betsy Holman wrote �The 35-pound CQR alternatively bit and skipped along the bottom without getting a good hold. This would seem to be the nature of this anchor when it fails to bury.� On a hard bottom, it is not uncommon to drag a plow in this situation for 50 meters without a set � the only solution is to pick it up and try again, and hope that next time it lands on the seabed with the right attitude. Claws have a unique quirk in the form of hop-and-skip behavior. This is technically known as roll-stability (or lack of), and is seen when the anchor has a large amount of force applied to it. Any anchor, no matter how effective, will drag if you apply enough force to it, and its behavior beyond this point is particularly telling. The claw, once dragged beyond its yield, hops out of the ground, then skips along until it manages to dig in again. Unfortunately this process tends to continue since the boat, once dragging anchor, will tend to only gather speed, and the anchor becomes less and less likely to set once more. Why does it hop out in the first place? Because it is not roll-stable. Sand or mud tends to 'ball' in the anchor, and does not flow evenly past the flukes. This, combined with the huge amount of torque applied to the anchor as it starts to move through the substrate, trips it � and it rolls out. A graph of resistance, or holding power, over time, usually shows a steady increase as more and more force is applied (increasing wind or tide for example), then a sharp drop off (as the anchor lets go), followed by a series of peaks and dips as the anchor bites sporadically, only to fail again and again. Even if the peak holding power of the claw was good (it isn't), this behavior is unacceptable. Practical Sailor were quite explicit in their second round of testing, back in 1999. �Anchors that failed our 400-lb. minimum were the Bruce, Claw, Danforth�� they said. �Neither the Bruce, with an average holding power of 307 lbs., nor the Claw, which held to an average of 283 lbs., did anything to alter their reputations.� Poor holding power is the single most obvious potential issue with any anchor. (As an aside, although holding power is the ultimate factor, it is not the only one. An anchor with excellent holding power that never sets is of no use to anyone). Holding, or stopping, power mostly relates to a function of blade (fluke) area and configuration. All the old generation designs suffer from a basic lack of area � for any given anchor weight, there is simply not as much resistance as would be ideal. The claw, with the gaps between its 'fingers', is the worst. The plow is just that: its namesake is designed to drag a trench through the substrate, not generate resistance. 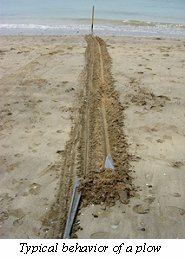 Plows are also a subset of weighted-tip types, which require a percentage of anchor weight to be taken up in ballast rather than effective fluke area. Having said that, a plow tends to outperform a claw, and benefits from moderately better roll-stability. That means it is a little less likely to trip out � but, if it does, it frequently ends up in the attitude discussed above that prevents it from setting, which is very dangerous. The plow's graph of holding power over time will increase steadily to a point higher than that of the claw, but if it rolls out, the graph will dive to practically nothing, and stay there as your boat drags the anchor along on its side. These are the functional issues with the old generation designs. The new generation anchors address many of these issues, and mostly successfully. (The phrase �new generation� is a favorite of the author's � and, while it is clearly something of a clich�, it is appropriate. Anchor design is something of an evolutionary process, with clear period distinctions � and the new generation is usually better than the old). They consist of the very basic German designed B�gel, known as the Wasi in the US, the French designed Spade, and the New Zealand designed Rocna, amongst others. The first two have been around for some time now, with their owners seeing vast improvements in general anchoring security. �� anchors which lie comfortably on a flat surface (principally the CQR and Danforth) are prone to skidding across the seabed and failing to find grip.� � Prof. John Knox considering the results of his own anchor testing for Practical Boat Owner. Knox also commented that �The SPADE was the best performer for a given weight. It was roll-stable and held extremely well. It was also the most deeply buried anchor. The Delta� and Bruce� gave about 60% of the SPADE's hold.� This was before the Rocna was developed, and the B�gel was not tested. ""Ploughs are designed to divide the seafloor� the planar B�gel will resist more than a simple wedge and the concave shaped Spade will resist the most." � Adrian Faulkner discussing which shape an anchor's fluke should be, convex or concave, in Practical Boat Owner. When asked if Mediterranean charter operation Yildiz Yachting had problems with holiday-makers dragging their anchors, Kees Verboom replied �We used to. We often had to repair boats that were damaged on rocks after anchor dragged. But since I changed the whole fleet over to German B�gel anchors, there's been no problem.� Yet, as good as the B�gel (AKA Wasi) and the Spade are, there was room for improvement, and the Rocna in one sense represents the best of both. It has a roll-bar like the B�gel, which guarantees the anchor achieves the correct attitude every time it hits the bottom. It has a concave blade shape, like the Spade, aiming for the optimum resistance given by a spoon shape, which maximizes holding power once set. Setting is practically instant owing to the cutting edge chisel tip and general geometry of the design. Since there is no additional tip-weight (lead insert), every gram of the anchor is put to functional use, and the side-profile of the fluke is reduced, allowing ideal penetration in hard or weedy surfaces. This gives much better performance on a weight-for-weight basis. The roll-bar, the most obvious feature upon first glance, allows the lack of a dedicated weight in the toe of the fluke. Plows invariably have some such weight. Some commentators incorrectly assume that a high tip weight is required to push the tip into the seabed, quoting specifications such as percentage-weight-on-tip (i.e. what percentage of the total weight of the anchor rests on the tip when in a setting attitude). However, the reality is that forces in the form of torque applied by the rode as your boat pulls on it are far more important than the relatively small amount of weight force present. Your anchor does not set itself when it is resting on the seabed, with no force on the rode. It is only as it starts moving that the toe begins to cut in, and, in the case of the Rocna, the mounting resistance on the fluke combined with upward resistance on the skids (mounted on the back of the blade) twists the anchor upright as it sets. "It is unbelievable in 38 years of sailing I have never before felt an anchor set in such a powerful way. I've used Danforths and various plough-type anchors in the past. The Danforths picked up bottles and cans that caused the flukes to jam in the closed position so it would not set. The plough seemed to roll out as the yacht veered in a gust. The Rocna just digs in deeper and holds." � Lou West, of Guardian Marine New Zealand, on his experiences with old and new generation anchors. Fewer vessels will find themselves in trouble as these new anchors become more widely seen on bows. The author, together with his wife, has done 10,000 nautical miles now on his 50Kg (110lb) Rocna prototype, including a circumnavigation of New Zealand down to 47 degrees south, sometimes in extreme weather � hundreds of sets, and it never dragged, nor was it ever required to be set more than once. The B�gel is now very popular amongst cruisers in the Mediterranean. John Harries & Phyllis Nickel on Morgan's Cloud recently wrote an article in Cruising World about their upgrade to two Spade anchors, saying they had effectively solved all their old anchoring problems in their high-latitude cruising grounds. American cruising guru Steve Dashew is using a Rocna on his new motoryacht Wind Horse. The trend behind these movements is a welcome one, and fellow cruisers should be encouraged to also consider upgrading their old generation hooks � or at least consider adding a new generation type to their inventory. The failings of the older designs no longer need be tolerated, as the technology of anchors has simply evolved that little bit further. Far superior, and safer, anchoring performance may be expected. Of course there are, and will be, the inevitable variations and copies, which add gimmicks as sales ploys or take shortcuts to cut costs but do little to further the technology. With care however, and sensible buyer awareness, the new generation anchors can mean the old clich� that 'newer is better' is, for once, true. That means better anchoring. And that means better cruising. Peter Smith is the original cruiser. He sailed competitively in his early days, as well as founding successful New Zealand production boat-building firm Cavalier Yachts in the 60s. He and wife Josephine left New Zealand in 1978 to go cruising onboard Apteryx, a Cavalier 39. A professional yachtsman and boat-builder, Peter is back in New Zealand on his own custom designed and built 15m (50') aluminium sloop Kiwi Roa. 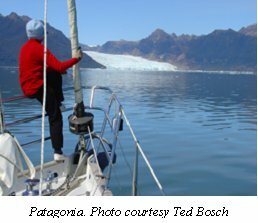 He has spent thirty years engaged in professional sailing, yacht deliveries, and boat-building all over the world, including 10 years of running his own yard in Colchester, England � where Kiwi Roa was built. Kiwi Roa is currently hanging out in New Zealand, with plans to head off again early next year, east-about this time, starting with Chile, Patagonia, and the Antarctic. In the meantime, his Rocna anchor design is being developed commercially, primarily for the cruising market. More information about the Rocna anchor, and further discussion about Peter's anchor philosophy and design, can be discovered online at www.rocna.com.